The new year is three days old and I have my first three rounds of 2016 already in the books. That’s a pretty great feeling. I have plans to play this morning and may even play a fifth round (weather depending) on Tuesday. I know people love watching college football and the ability to affix yourself to the couch and watch roughly 12 consecutive hours of bowl games. But I will take golf over football pretty much all day every day. 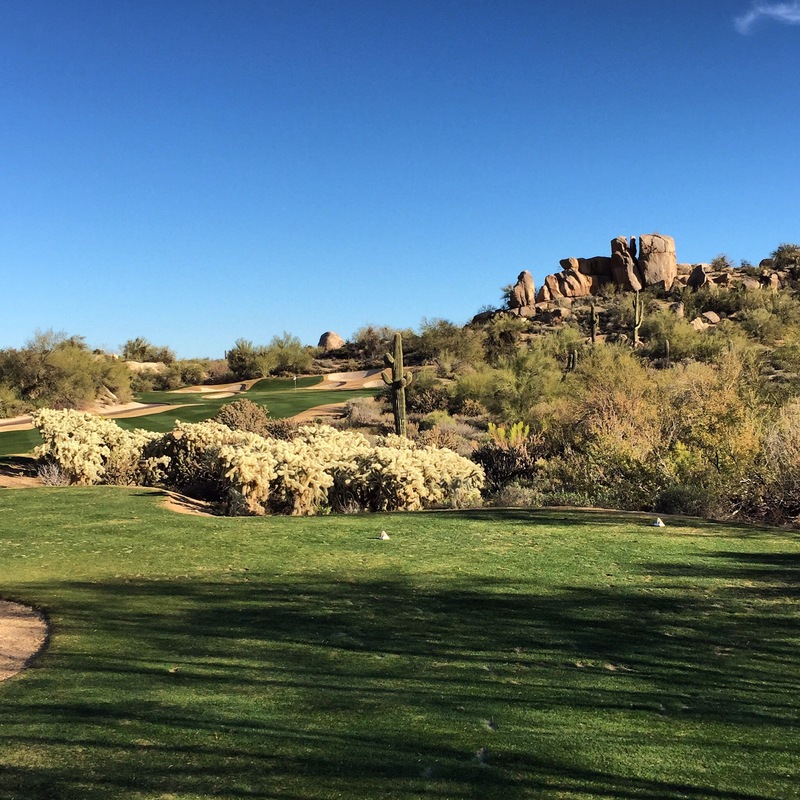 So after flying to Phoenix on New Year’s Eve, I teed it up on the South Course at The Boulders. The good news is that I found a great rate on the Internet. The bad news is that one hole/15 minutes into 2016 I already had my first double bogey of the year. This was only the second time in my life when I played on New Year’s Day. The other was on Jan. 1, 2000 when I was living in Raleigh, NC and played a local semi-private course called Wildwood Green. Obviously my attitude is shaped by having lived in Minnesota for much of my life – and for having New Year’s come during my busy season when I was a sports hack. But it feels like you’re stealing something when you get in rounds this early in the season. I followed up The Boulders – which is not a great value, FYI – with a Jan. 2 round at Wildfire (Palmer) at JW Marriott. On Sunday, Jan. 3, I joined a couple of friends for a round at Tonto Verde. While I hit a bunch of foul balls off of the tee, it is always fun to play when there is snow on the ground at home. Once upon a time, Jeff, there was a guy who worked here at the Pioneer Press whom I would see once in a while, almost always in the elevator. He was a sales guy; worked on a different floor. He was a golfer (a well-known sandbagger, as a matter of fact; played for substantial stakes with his client car dealers), and he played a lot — all year long. He made a habit of seeing me in the elevator in the middle of a nasty, cold winter and saying something like “I need to tell you about the round I played last week at Cypress Point.” Of course he really didn’t have to tell me about the round, nor did he ever tell me about his round; he just had to mention that he’d played at Cypress Point! If you’re not careful, you could be taking his place in the “Damn You and Your Endless Summer!” club. Just kidding, of course. I like you. I didn’t like him. I’m happy to hear that you’re getting to play some golf! How’d you like Tonto Verde? I’ve heard good things. Rose’s high-school team used to go out there every March. Well, if it makes you feel better, I have nothing else scheduled this point. My next round of golf will certainly be on my PlayStation. That said, I’m guessing I will play again somewhere in the next 90 days. Tonto Verde is a nice place. Played both courses. I liked the Ranch course much more than the Peaks. The holes were more interesting and there was a little more room to hit the ball off of the tee. The Peaks is Southview tight in a bunch of spots. I have a deposition in the middle of nowhere Alabama next week. (Looked up the town I’m going to when I got the notice–apparently it’s the place where the school principal cancelled the prom back in the 90s because he heard there would be interracial couples attending. Apparently they elected him superintendent a couple of years later. Lovely.) Hopefully I can arrange the trip right to get at least one more January round out of the deal. Yes, the Sagauro is really nice. And they are happy to let you walk, which is such a rarity in Arizona. There is a surprising amount of at least decent public golf in Alabama. I have played RTJ Trail courses in Auburn, Birmingham, Montgomery and Mobile over the years and all are at least pretty good. None are going to blow your mind, but you won’t hate it. I have played Capstone Club (Gil Hanse) between B’ham and Tuscaloosa, but I think that place may have closed for good now. Me and a couple of buddies went to FarmLinks the last two years before the Masters and the course there is great. The lodging and food is even better. A nice spot. If you have any questions on Alabama, let me know.